Blackwolf Workout Review – Is This An Effective Workout Formula? Get Information Here! - Becoming Alpha Male Blackwolf Workout Review – Is This An Effective Workout Formula? Get Information Here! Blackwolf Workout Review – Is This An Effective Workout Formula? Get Information Here! Blackwolf Workout Review – Is This An Effective Workout Formula? Get Information Here! Supplements for workout such as BlackWolf Workout have come a long way since their inception. This gave rise to a plethora of them that claim to be fat burners, muscle builders, and thermogenic. Here, we are talking about enhancement products taken before, within or after workouts for energy and enhanced physical appearance. Evidently, we must have stumbled over a good number of them and possibly have used them in one occasion or the other. This industry is evolving, hence more of these body enhancement products are being made to meet up with the latest demands and technology. Black Wolf Workout; the basis of this write-up, claims to be a unique power blend to achieve the maximum result. The manufacturer does have an official website. Also, it has been reviewed and sold on other retail websites. What are the product’s action modalities? Is it safe for the stated benefits? Follow the review for more details! 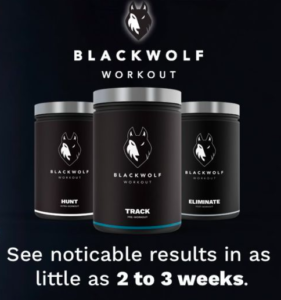 BlackWolf Workout is advertised as a pre-workout supplement designed to enhance nourishment of muscle tissues and to stimulate muscle development during workouts, such as power lift. It is said to significantly improve the physique of the user. It is a new workout supplement formulated to benefit both men and women in building their body, and it should function to support its users in performing better during workouts by gaining improved stamina. The Black Wolf supplement is claimed to help users achieve better focus during the process of burning fats and workout as well as boosting growth levels in developing muscles. It should also help endure strenuous exercises. BlackWolf workout is supplied by Wolfson Berg Limited. There are the BlackWolf hunter pack and BlackWolf huntress each of which has the Track, Trail, Hunt and Eliminate sub-packs. They can be purchased online from its official website at price $82.95 for BlackWolf hunter pack and BlackWolf huntress pack. It might interest us to know that Blackwolf packs for men comprises of Track, Hunt and Eliminate whereas that for women comprises of Trial, Hunt and Eliminate. L-Leucine, isoleucine, taurine, L-Valine, creatine, CoQ10, zinc citrate, L-Methionine, whey protein, d-aspartic acid, L-Glutamine, vitamin C, B1, B5, B6, B12, xathan gum, stevia extract, and natural flavoring. L-Leucine, isoleucine, taurine, L-Valine, creatine monohydrate, CoQ10, zinc citrate, L-Methionine, whey protein, CLA, L-Carnitine, L-Tartrate, green tea, vitamin C, B6, B5, xanthan gum, stevia extract and natural flavoring. L-Leucine, isoleucine, taurine, L-Valine, creatine, CoQ10, zinc citrate, L-Methionine, whey protein, vitamin C, B5, B6, E, potassium citrate, sodium chloride, kelp, magnesium citrate, calcium, xanthan gum, stevia and natural flavors. L-Leucine, isoleucine, taurine, L-Valine, creatine, CoQ10, zinc citrate, L-Methionine, whey protein, vitamin C, B5, B6, potassium citrate, kelp, xanthan gum, magnesium phosphate, stevia extract, natural flavors, brown rice flour and dicalcium phosphate. According to the manufacturers, Black Wolf is said to be pre-workout supplement claimed to boost the level of testosterone level in the body. It should work by causing rapid or enhanced circulation of blood which in turn will cause thickening and widening of the blood vessels for free flow. It is said to boost growth and muscle development while providing extra energy to endure prolonged exercise. The manufacturer’s recommendation is that we take one capsule in the morning; 30 minutes prior to daily workout and another capsule in the evening before bedtime. Altogether, two capsules are recommended per day. In line with the manufacturer’s description, we are expected to achieve a significant result with 60-90 days of using BlackWolf supplement, working out as required and eating a healthy but balanced diet. According to them, regular use of BlackWolf Workout does not cause any side effect since the nutrients are natural. BlackWolf Workout is recommended for adults; men and women who look forward to achieving healthy growth goal and significant muscle development. 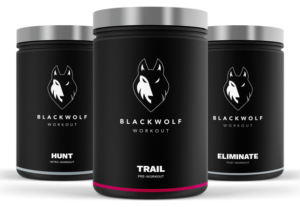 The BlackWolf hunter promotes to be made specifically for Men while BlackWolf huntress is for women each of which come in 3 types of packs, namely; Trail, Hunt, and Eliminate which are claimed to ignite energy and focus, maximize every workout and accelerate recovery and gains respectively. These effective formulas are for individuals above 18years of age. This supplement should not be taken together with other medications. Physician’s advice is also recommended prior to using this product. The supplements may interfere with other medications, plus the products are relatively pricey. 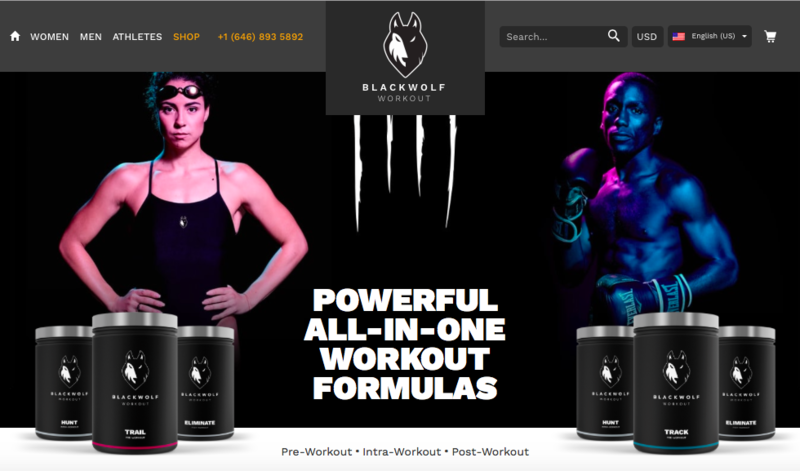 Wolfson Berg Limited; the sole supplier of Blackwolf Workout formulas, states to give refunds for returned ones that have not been opened. From their explanation, the refund is valid for products that have not exceeded 14 days from the day of receiving them. They mention offering free US shipping of which all products purchased from them are discretely shipped. Payment should be flexible and secure. 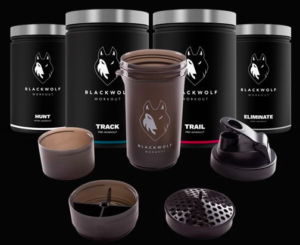 Buying either package of BlackWolf Workout should entitle us to a free Shaker and a Workout 5 Essential Guide. Wolfson Berg Limited shares to offer professional customer support. Customers can communicate with them by using the company address, email, message form in their official website. There is a phone line there as well. Blackwolf Workout formulas (Blackwolf Power BlendTM), promote to be the game changer guaranteed that support optimum performance. Evidently, their contents are natural no wonder the manufacturer mention that they should not cause any unwanted effect. The result from using them is said to be fast (within 2-3 weeks). The manufacturer’s information is explicit and I could find some recommendations for the formulas. 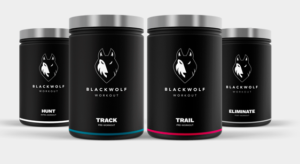 In my perspective, I will describe Blackwolf Workout supplements as enticing and impressive supplement packages that can truly help improve our fitness program. Plus, it does provide their own workout instructional guides that can significantly help our training and diet. To find out more, you can visit the BlackWolf Workout product’s official website at (www.BlackWolfWorkout.com) and go from there. Don’t forget to leave me your comments down below! It is my pleasure to read them and get back to you as soon as possible. Don’t hesitate to share your mind! Posted in Blackwolf Workout	tagged with Black Wolf Supplement, Blackwolf Workout, Blackwolf Workout Reviews, Blackworlf Workout Review, Does BlackWolf Workout Work?